Medical Construction & Design (MCD) is the industry's leading source for news and information and reaches all disciplines involved in the healthcare construction and design process. 28 Medical Construction & Design | M A RCH /A PR IL 2018 | MCDM AG.COM T he Facility Guidelines Institute's Guidelines for Design and Construction of Hospitals and Outpatient Facilities are broad- ly accepted as best practice in healthcare facility design and construction, and its recom- mendations are incorporated into building codes in many U.S. states. The guidelines acknowl- edge that speech privacy and acoustic comfort are key driv- ers of eff ective overall design, the importance of which is fur- ther underscored by the Health Insurance Portability and Accountability Act and mon- etary incentives introduced via the Centers for Medicare and Medicaid Services' value-based purchasing program. The latter partly hinges on patient satisfaction scores derived from the Hospital Consumer Assessment of Healthcare Providers and Systems survey, which includes the question, "During this hos- pital stay, how often was the area around your room quiet at night?" Since 2007, scores related to this query have been consistently low across the country, suggesting more should be done to address the issue of poor acoustics. However, in trying to meet this challenge, FGI continues to rely on traditional noise control methodologies that emphasize isolation. Given the impact on patient well-being, hospital funding and construc- tion budgets, it is worth explor- ing another strategy—namely, the use of controlled minimum background sound. 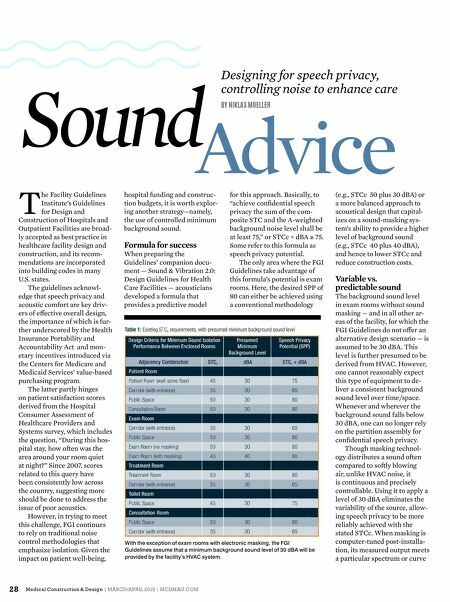 Formula for success When preparing the Guidelines' companion docu- ment — Sound & Vibration 2.0: Design Guidelines for Health Care Facilities — acousticians developed a formula that provides a predictive model for this approach. Basically, to "achieve confi dential speech privacy the sum of the com- posite STC and the A-weighted background noise level shall be at least 75," or STCc + dBA ≥ 75. Some refer to this formula as speech privacy potential. The only area where the FGI Guidelines take advantage of this formula's potential is exam rooms. Here, the desired SPP of 80 can either be achieved using a conventional methodology (e.g., STCc 50 plus 30 dBA) or a more balanced approach to acoustical design that capital- izes on a sound-masking sys- tem's ability to provide a higher level of background sound (e.g., STCc 40 plus 40 dBA), and hence to lower STCc and reduce construction costs. 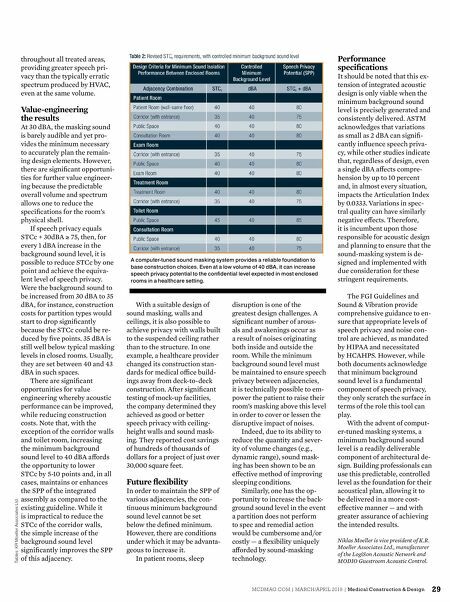 Variable vs. predictable sound The background sound level in exam rooms without sound masking — and in all other ar- eas of the facility, for which the FGI Guidelines do not off er an alternative design scenario — is assumed to be 30 dBA. This level is further presumed to be derived from HVAC. However, one cannot reasonably expect this type of equipment to de- liver a consistent background sound level over time/space. Whenever and wherever the background sound falls below 30 dBA, one can no longer rely on the partition assembly for confi dential speech privacy. Though masking technol- ogy distributes a sound often compared to softly blowing air, unlike HVAC noise, it is continuous and precisely controllable. Using it to apply a level of 30 dBA eliminates the variability of the source, allow- ing speech privacy to be more reliably achieved with the stated STCc. When masking is computer-tuned post-installa- tion, its measured output meets a particular spectrum or curve Designing for speech privacy, controlling noise to enhance care BY NIKLAS MOELLER Advice Sound With the exception of exam rooms with electronic masking, the FGI Guidelines assume that a minimum background sound level of 30 dBA will be provided by the facility's HVAC system.